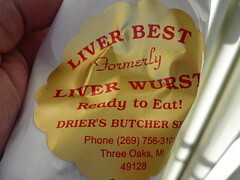 Drier's Meat Market in Three Oaks, MI has been mentioned in multiple 'Beyond Chicagoland' threads, twice in the 'best thing you've eaten lately' thread, twice in a liverwurst thread. It is also mentioned in a thread for great meat market hot dogs and even has it's own thread in the 'Shopping and Cooking' section (albeit hard to find searching with the apostrophe) dedicated to their liverwurst. But no pics are out there and since it's mentioned a few times in this here Harbor Country thread, which is where it is located I'll share some here. 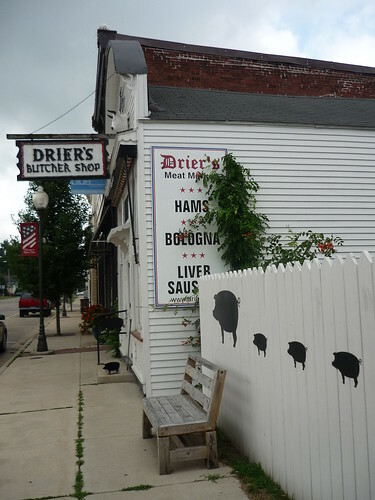 Drier's is a nationally historic landmark and has been a butcher shop since the time of it's opening in 1845. They have all sorts of stuff on display from past days. I stopped in here maybe five years ago and decided to get some of their liverwurst or as it goes by here, liverbest. Described as more of a "country pate" they take their spreadable liver sausage serious at Drier's which is still all in the family. 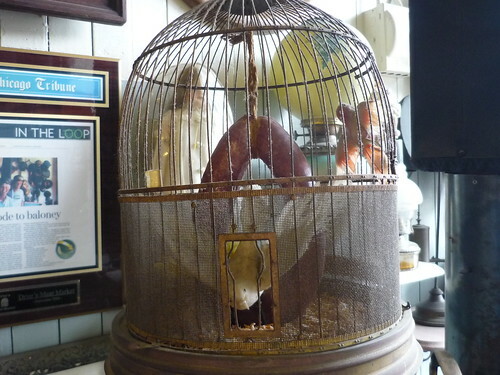 The smoker for the meats is over 100 years old. I'm not quite an old timer just yet and didn't grow up on the stuff and I didn't think I liked it until I tried some of the pate I brought back for my mom and then instantly became a super fan. I ate it all. Spread on a cracker with a dash of their cheddar tub cheese was all of a sudden one of my favorite snacks. Well I stop by whenever I'm passing thru or staying in Harbor Country. This old school butcher shop is world famous for their liverwurst and also puts out other great items such as their hot dogs, tub cheese, jerky, smoked meats, mustard or whatever else might be in the meat case that day. Well worth the stop if your ever out that way, passing thru or spending the day/days at Warren Dunes. Bring a cooler and you'll be good to go. For others who find themselves in this corner of Michigan, another less known but very good meat market is Gary's in Union. They are mostly a processor for hunters and small farmers (they process pigs I get from an organic farm in Dowagiac, Heartland), but also sell retail and offer various sausages and smoked charcuterie. Gary's walls are covered with awards from state-run competitions, fairs, etc. over the years and deservedly so. They recently advertised a 1/2 hog special -- $175 for a fully processed and packaged 1/2 carcass broken down into the usual cuts. Also nearby is the quaint Swiss Valley ski area, which is no Vail but will do if you're looking for a place to shake off the rust for skiing/boarding season, and beautiful, sand-bottomed Corey Lake. If you are in the vicinity of Three Oaks, definitely stop at Drier's. They've branched out some in the past few years, with a new generation taking over. The liverbest really is good! Likewise, I think their German ring bologna is very good. 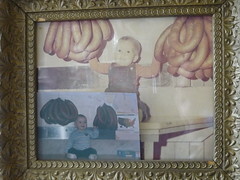 I recently tried their pork and veal brats, and everyone enjoying the meal commented on how good they were. They now carry various pickles and jams, as well as their standard crackers and tub cheese. Just a few doors away is the Elm Street Bistro. We've eaten their several times, and been pleased. While the menu is pretty much standard mid-western, everything we've had was well prepared with enough attention to freshness and variety to make it better than a standard small town cafe, but at the same price. I've always been unimpressed by Drier's. 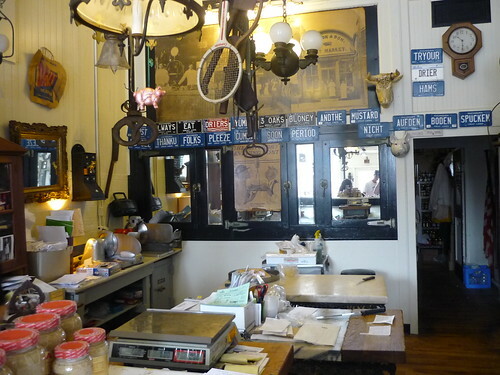 It's more of a curio/souvenir shop than an actual working butcher. You can buy some liverwurst or dried sausages there, but you can't get anything as basic as a steak or a chicken. If you're doing some cooking and looking for excellent meat in Harbor Country, you have to go to Falatic's Meat Market on Red Arrow Highway in Sawyer. If it's a holiday make sure you call in your order ahead of time, it can be a mob scene on summer weekends. I concur with your comments on Falatics. Really nice meat market. The tables at the private boat docks are not for public use, however. They are privately owned by the dock owners. That might sound harsh, but I've had to clean up beer bottles and smeared ketchup, etc., from ours a number of times. Timothy's at Gordon Beach has never disappointed us for a nice dinner. For casual fare we usually choose Red Arrow Roadhouse. Bentwood Tavern was packed, staffed with incredibly attractive people, woefully overpriced, and roundly unimpressive on both the cuisine and service fronts on our visit last week. This in no way spoiled an otherwise wonderful trip and weather bookended by Stop 50. "Kobe" burger ordered medium rare was served past well and without the requested bacon, and the 35 minutes the kitchen took to get it out did not brook a re-do. Fries were limp. Arugula salad fresh from the bag with goat cheese and dried cherries, yawn, $10. Three subdued shrimp on polenta that might have been single-serving Quaker Oats instant grits, $12. Wedge salad was rusty and prepared without art. Nearby tables waited longer for saucer-sized $30+ entrees. View out to the marina was very nice. I'd like to cut them some slack, but a place open this long and handling so many special events should be able to deal with a big turnout with some measure of grace, sorely lacking this past weekend. This is kind of a stretch for a Harbor Country post but it is in Berrien County... I am posting to see if anyone has been to this place lately, it was a favorite of my family growing up and was a true supper club, Timberline Inn in Eau Claire Mich (or Dowagiac). A fellow posters request for a true supper club got me thinking about this place. It had a relish tray and it was located near Indian Lake. I googled and they have a website that looks more updated than the restaurant. Instead of relish tray they are calling it a "gourmet table"
I searched and didn't see any posts about it, has anyone been here lately? Been many times. Last visit about 6 weeks ago. It's a rustic supper club for sure. Spinning gourmet table with beer cheese, liver spread and herring comes with. Steaks are ok. Fried chicken is the sleeper hit. Not a fan of the fish, which has a high bar in the area. Worth a stop. Not the greatest supper club but the real deal and generally solid. Recent ownership change doesn't seem to have led to changes in the kitchen or front of house. Otherwise, Heston Bar down on the IN/MI border nails the supper club/ roadhouse vibe. PS, it's not a tray- you walk up and get stuff like a salad bar, but the contents ain't salad- unless you count beets and 3 bean. I go mostly for the table, a stiff Manhattan and the vibe. It will be what you recall. This restaurant used to be a so-so hot dog and ice cream stand with license plates for decor. The new owner has made a huge renovation, added smokers, etc. I had a good pulled pork sandwich-- very soft meat, not super-smoky. My husband had the chopped brisket, which was excellent. The kid had very good chicken tenders, fried to order. They have a good selection of sides in a steam tray-- I really liked the corn spoonbread and the mac-n-cheese is kid-approved. We were driving, so did not take advantage of the decent selection of beer in bottles-- although I was wishing for a Two-Heart with my sandwich. This terrific seafood market is a gem with great fish, beautiful scallops, etc. and a very knowledgable proprietor. They have a small kitchen and make a handful of lunch items available for carry-out or to eat at the few small tables outside. Our favorites are the popcorn shrimp and the BLT with smoked salmon. The prepared foods available for take out look great, too. Peasant's pantry is a combination gourmet foot market with a deli counter (fra' mani, La Quercia products, nice cheeses, etc) with a cafe serving coffee products, breakfast and lunch. We have really enjoyed their smoked whole chicken (available for carry out) and had a delicious pulled pork sandwich there recently. We were in a lunch mood but the chorizo hash and the biscuits I spied on another table also looked great. Sides like fresh fruit, potato salad were also top notch.